We've certainly seen plenty of custom consoles before (N64's with portable screens and Xbox 360's inside Halo-themed briefcases spring to mind) and we've even cast eyes on a toy chainsaw as part of a special edition, but what happens when this two wayward sons cross paths? You get the 'Painsaw' - running a copy of Doom 2. 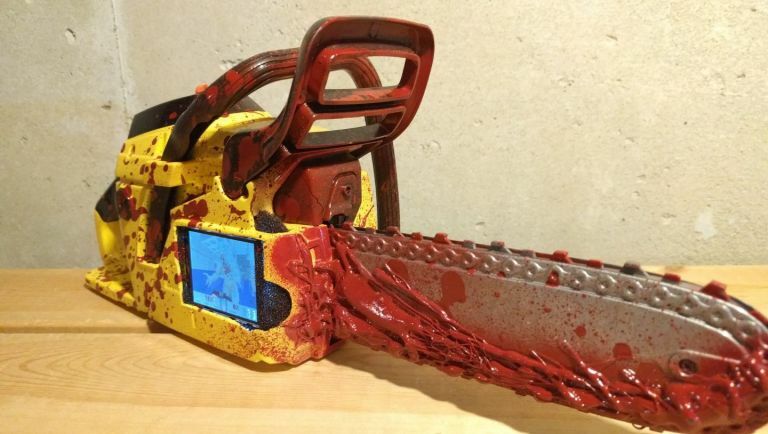 Created by one George Merlocco, the oddball peripheral takes a Echo Junior Chainsaw toy and firstly covers it in thick red paint to really capture that must-have, gored-drenched look. He then removes all its internal sound effect chips and rubberised blade and cuts a whole bg enough to fit a small screen. Finally he fits an Adafruit PiTFT 2.2" HAT LCD screen, adds in a Adafruit PowerBoost 1000 Charger to make it work on the go and finally adds a dash of Raspberry Pi Zero for flavour. Further proof that Raspberry Pi will work with anything, on anything. Headover to painsaw.rocks and you can see some of the photos from its creation, and hey, why not watch the retro video Murlocco produced to show off all his hard work. Yes, it mistakenly uses the date the original Doom was released rather than the sequel it actually uses but hey, who are we to judge the work of a master toy chainsaw portable console craftsman?